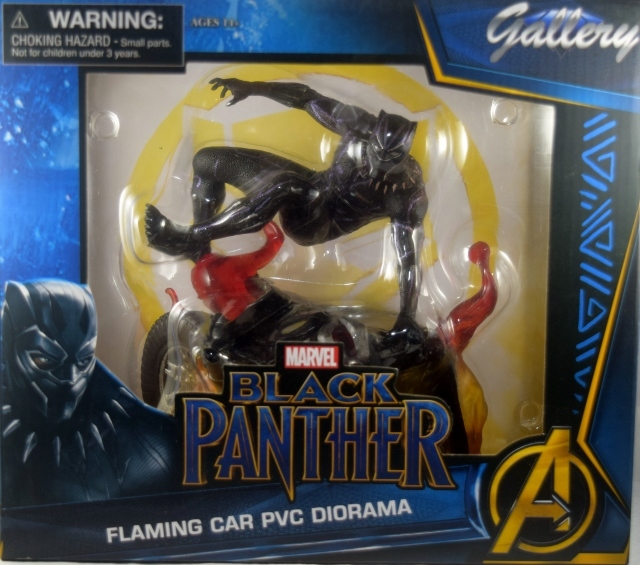 To help celebrate Black Panther’s 7 Oscar Nominations we thought this would be a good time to review Diamond Select’s Black Panther Flaming Car PVC Diorama. 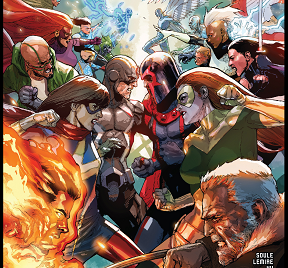 Black Panther made his big screen debut in 2018 and it was a cultural phenomenon that skyrocketed the character to the A list of Marvel superheroes. 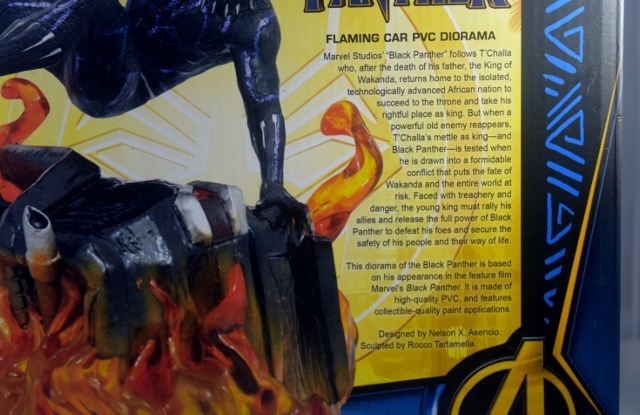 Diamond Select is giving fans the chance to own their very own iconic film moment in the form of Black Panther’s Flaming Car PVC Diorama. 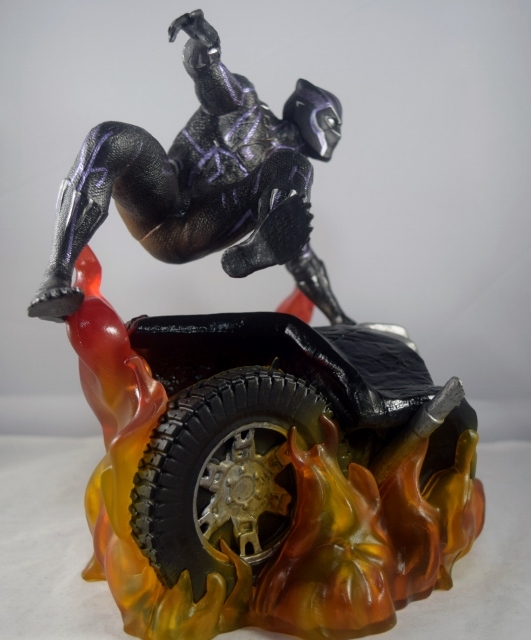 Designed by Nelson X. Asencio and sculpted by Rocco Tartamella this statue features T’Challa as he leaps over a burning, wrecked vehicle in pursuit of Ulysses Klaue. 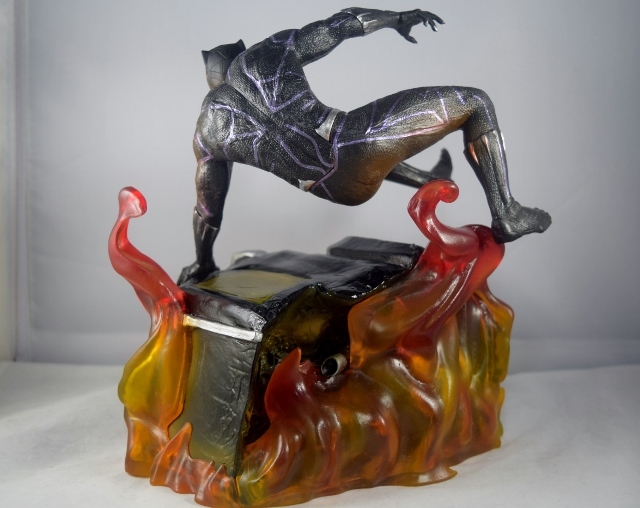 Leaping into action T’Challa’s suit gleams purple with kinetic energy, ready to unleash a shockwave of justice on his foes. 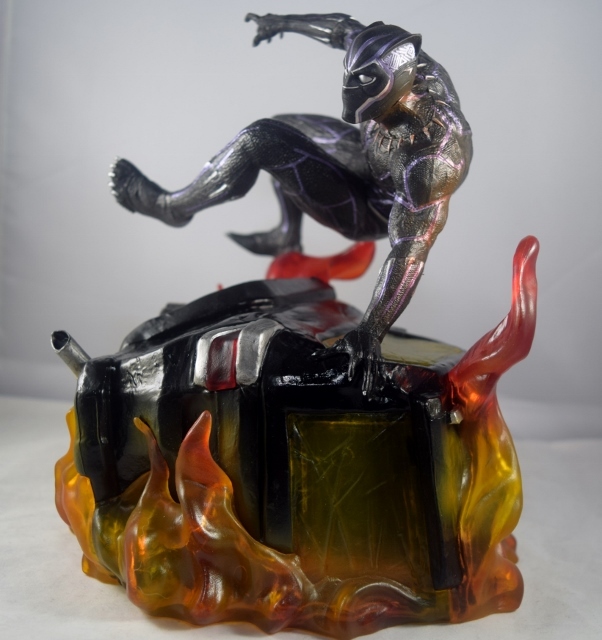 As far as Black Panther pieces go this one is a phenomenal inclusion and worth every penny. 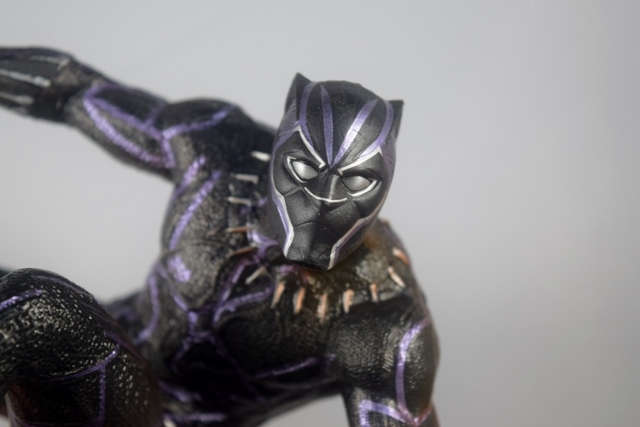 Black Panther statues and figures can sometimes be bland and uninteresting due to the characters’ classic flat black look, which admittedly is a bit boring when not in motion. 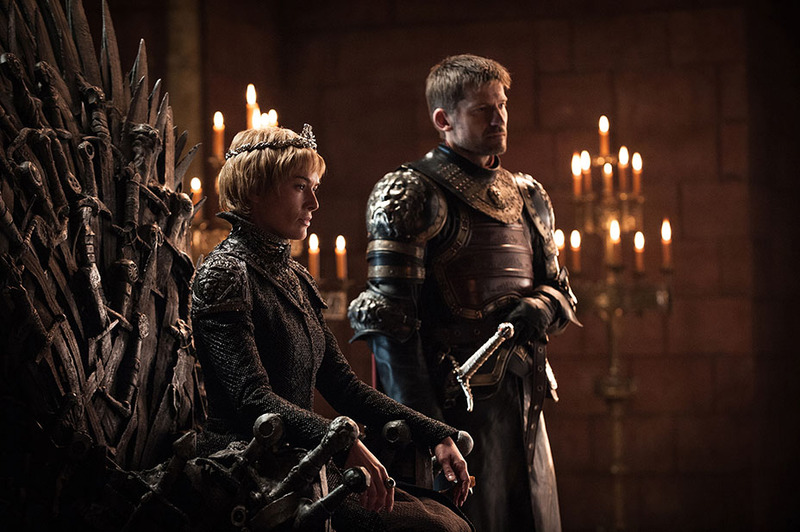 Diamond seems to have realized this and really brought the color out to highlight the King of Wakanda. 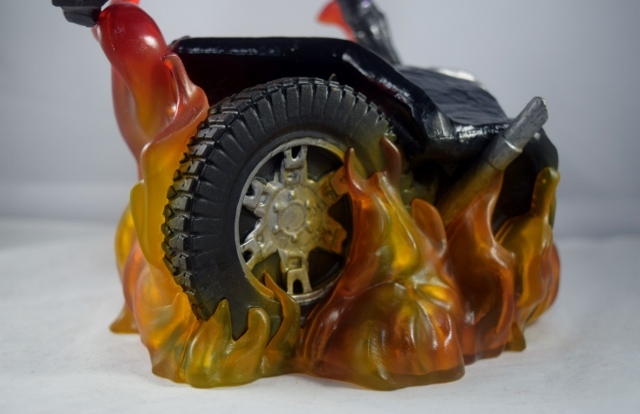 This statue really pops with color as the flaming car, acting as the stand glows with an array of oranges, yellows, and reds. 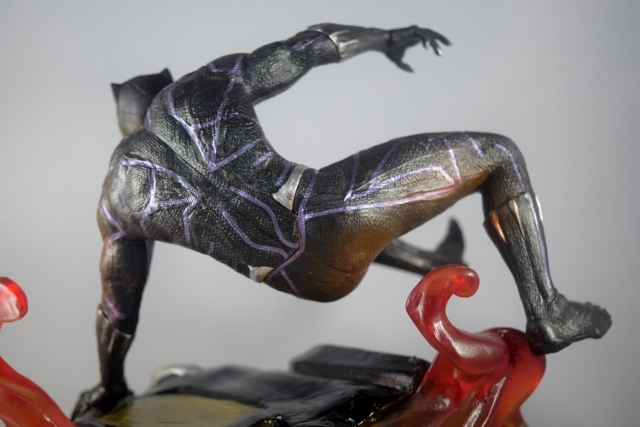 Then you have T’Challa’s suit which gives the illusion that the energized purple lines lit as they paint gleams and glows even with little light hitting the piece. 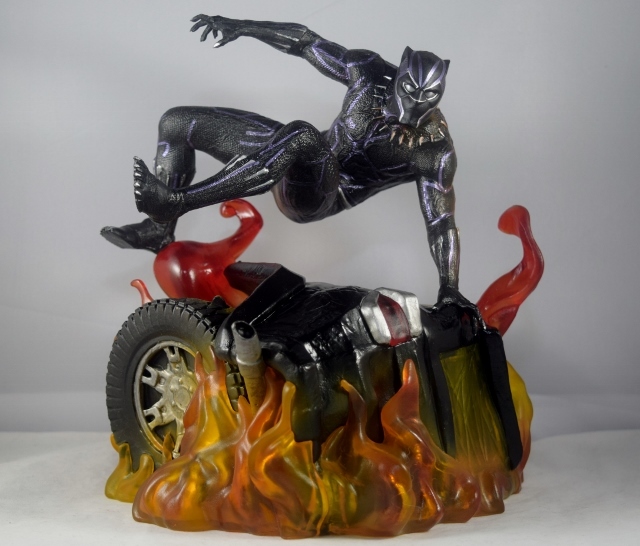 Considering this a Black Panther piece its the bursts of color that immediately catch your eye and bring you in for a closer look. 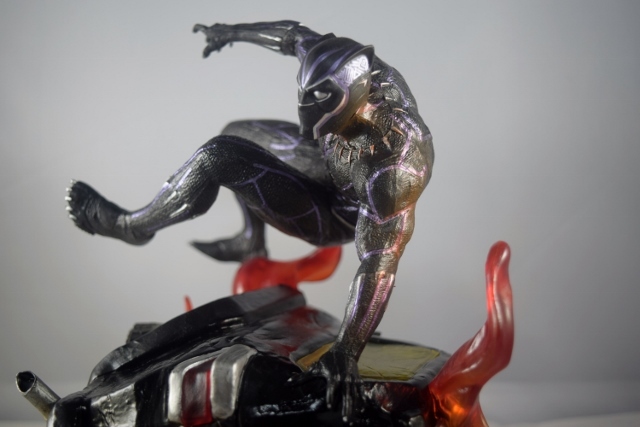 The color is definitely the highlight of the statue for me but that doesn’t discount the fact that the sculpt itself is near flawless. 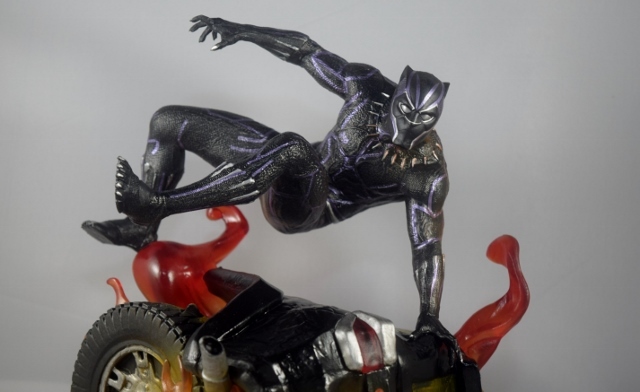 Ascencio and Tartamella’s work on T’Challa himself is everything I want in a sculpt. 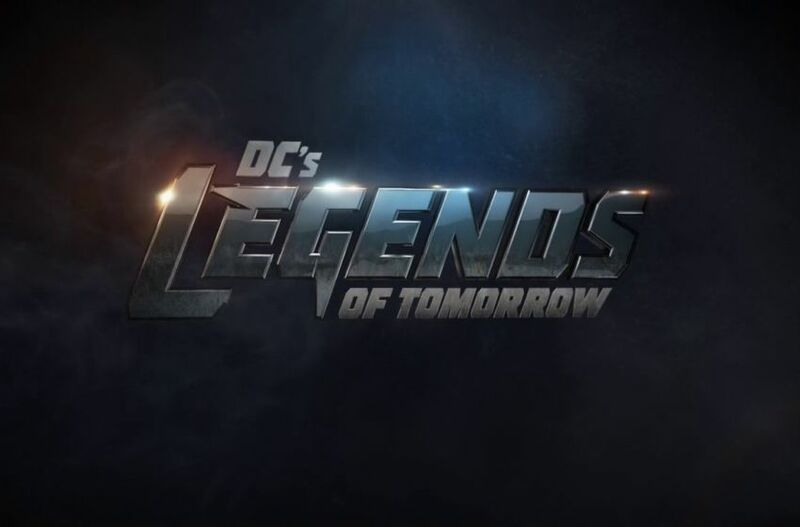 They give us a cool, unique, action pose that shows off our characters costume along with his prowess. Not only do we get a great pose but the character itself is perfectly rendered and looks like he is leaping directly off the screen and onto your shelf. 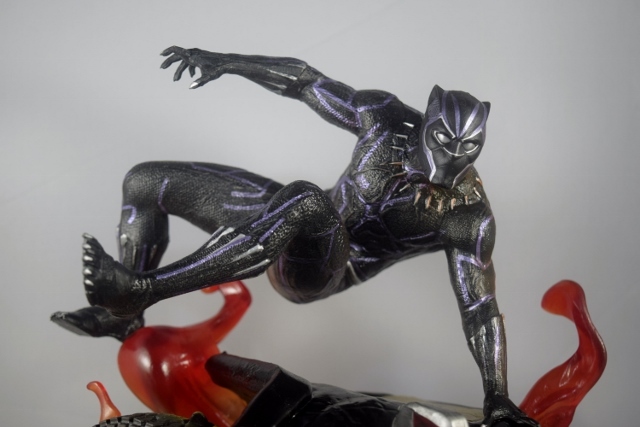 T’Challa looks amazing as he moves to take down the bad guys, the texture on his suit give it a warn feel as the purple lines really make it come alive. 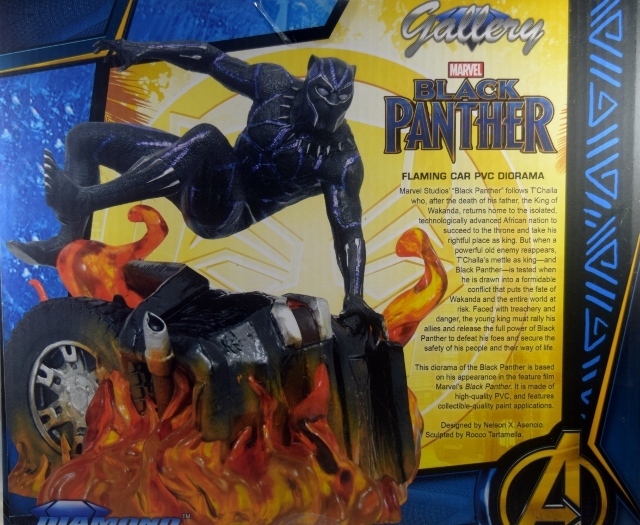 My only real complaint with this piece is the flaming car itself, while the flames and coloring look great, the sculpt itself doesn’t look as clean as Black Panther and so it just feels a bit off and out of proportion. 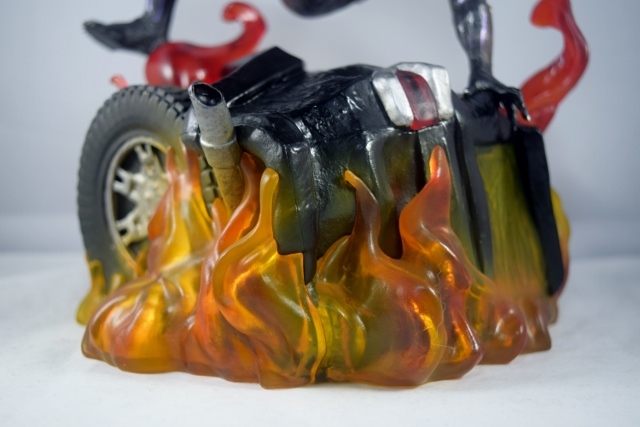 Despite my one minor complaint, this statue is everything I look for in an excellent piece. 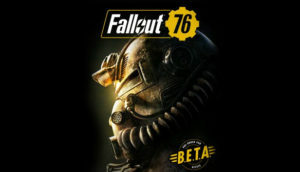 It has a great character sculpt featuring a unique action-oriented pose, it uses color and light to its advantage to enhance the piece and it looks like it was taken directly from the comic page or screen. 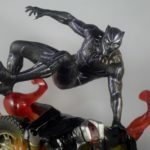 Black Panther fans will love this piece as it pays tribute to one of the best moments of the film and features one of the coolest aspects of the film, Panther’s kinetic blast. 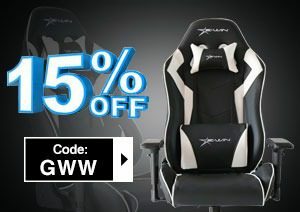 If you see this one in your local comic shop or online don’t pass it up. 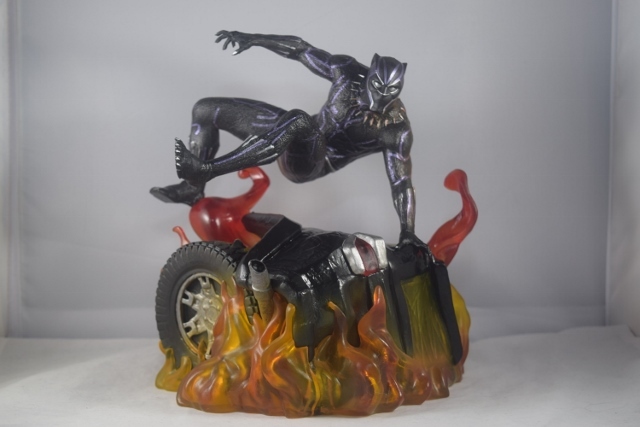 Buy it, give it a nice backlight and sit back and listen for all the ooh’s and awe’s as your friends admire the King of Wakanda doing what he does best.